I have been heavily wooed by the gorgeous pastel and muted nurseries that are out there. However, the reality is that babies aren't swaddled in pastels for long. From baby gyms to Bumbos to pretty much every toy that Fisher-Price makes, BOLD primary colors are going to take over the nursery (and the rest of the house...). 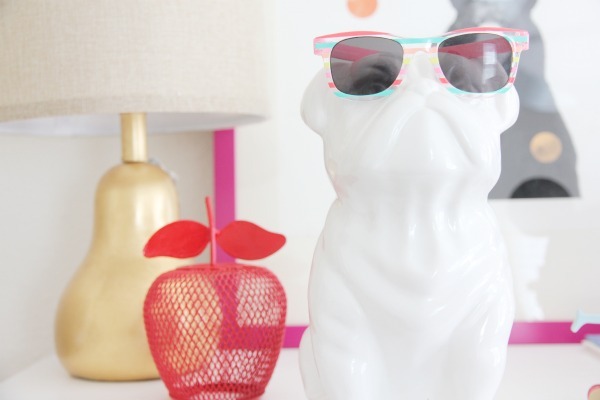 The other thing I love about bright colors? 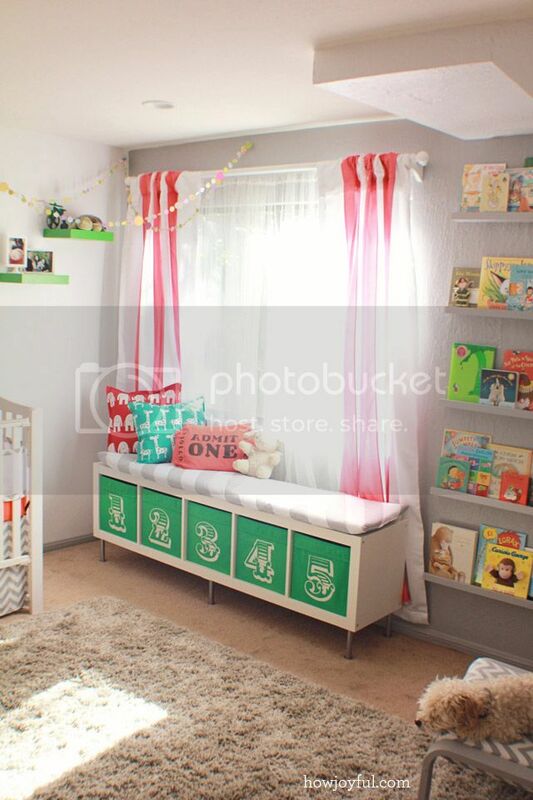 It takes kids a long time to grow out of the room because the theme isn't limited to the soft tones of a newborn and it's easy to add their new interest in Thomas the Train or Dora the Explorer without having to redo the whole room. So what are we thinking? 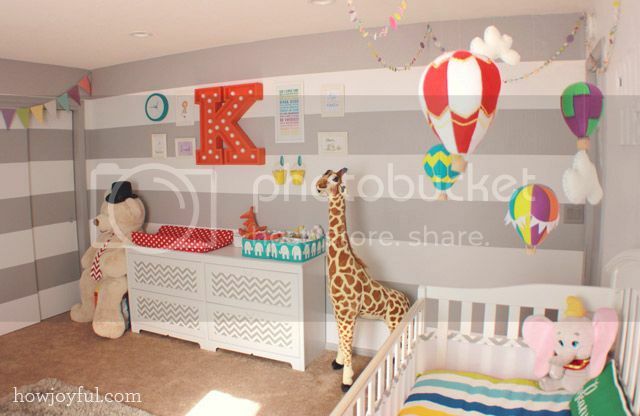 Let me first start with some of the colorful, gender neutral nurseries that I just LOVE. 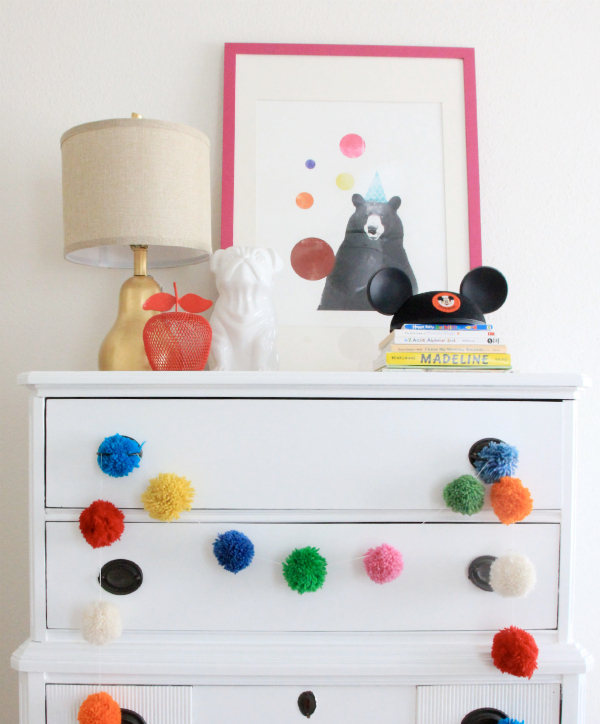 I have to start with this gorgeous nursery from Joy (and fellow Bee!) at HowJoyful. 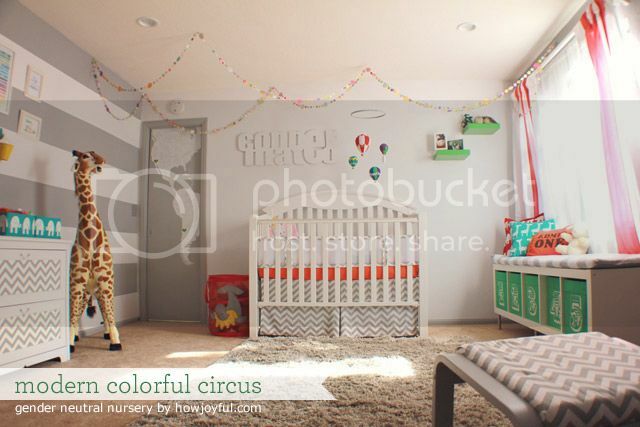 I was instantly inspired by the whimsical circus theme paired with muted walls, bright colors, playful patterns and the beautiful marquee letter of the changing table. If you go to the blog, you'll see that she actually made many of the unique elements herself like the hot air balloon mobile and the elephant lamp. 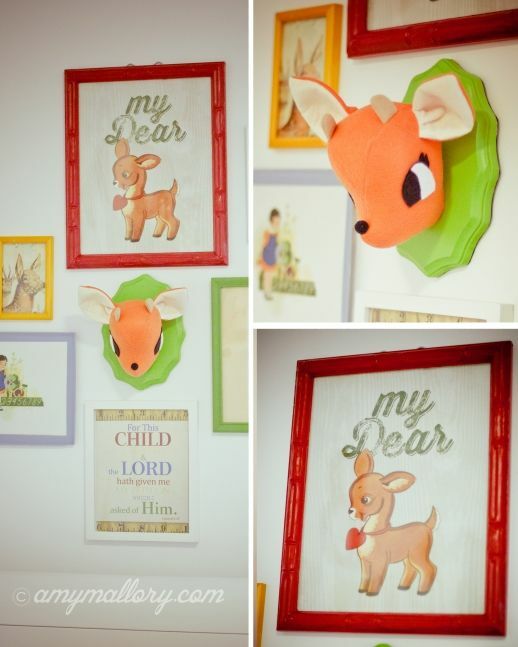 Seriously, my love for this nursery is just so much. 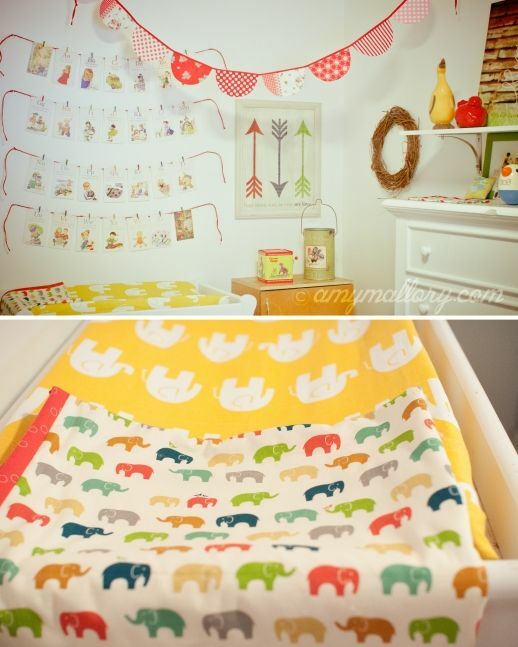 If you're looking for a quick inspiration, Lay Baby Lay is an amazing resource FULL of boards spanning every theme and color combination you could thing of. Here are a couple of my favorite primary color and brightly colored boards the have. 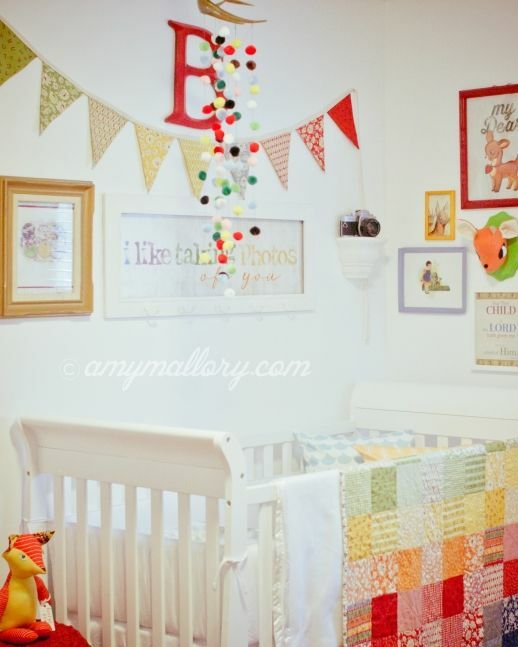 And to round out this round up, take a peek at this gorgeous nursery from Amy Mallory. Each element feels handpicked for the space and not a single corner or tabletop has been over looked. The original post has dozens of beautiful photos highlighting all the details, so be sure to head over there and take a look. What do you think? 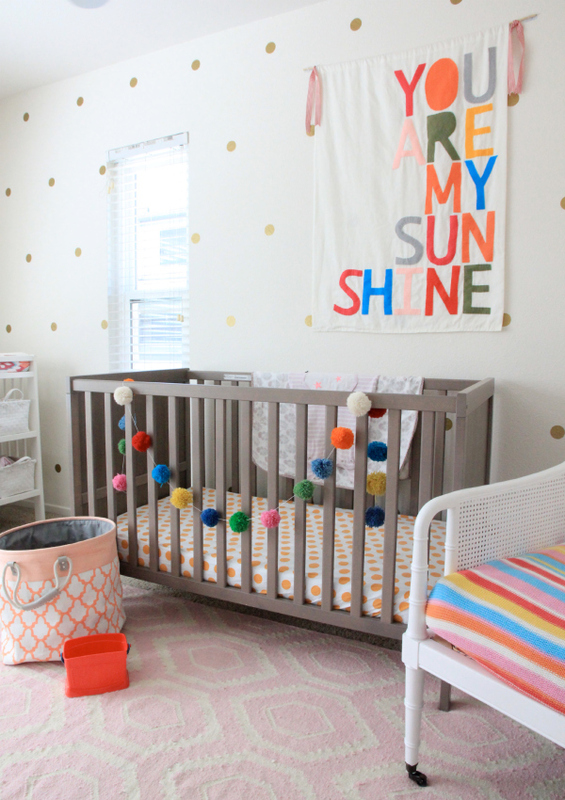 Have I convinced you that bright, gender neutral nurseries are the way to go? Next post reveals our inspiration board for our nerdery! 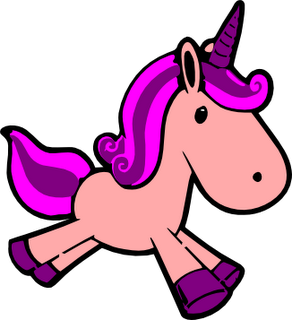 It was brought to my attention this weekend that I am a Pregnancy Unicorn. A dear friend of mine is due 3 months after us and was hoping to commiserate with me when we were together in Minneapolis this weekend, but I was a total let down. Every gripe she had, I was all "oh, yeah, I didn't have that." I'll be honest, I've noticed that I'm suuuuuuuper lucky this pregnancy. In fact, that's why I haven't been blogging about it. I mean, who wants to read a blog that's all sunshine and rainbows? No gross morning sickness stories, no terrible "I peed my pants when I sneezed" stories. That's BORING. So I've been following this advice. 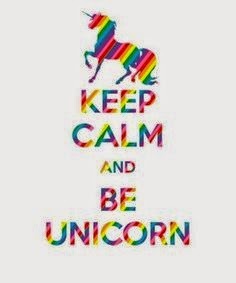 I've been keeping calm, and I'm a pregnancy unicorn. What does that mean exactly? Am I the only pregnancy unicorn out there?? How was your pregnancy? Are you there readers? It's me, Kelsey. I've been pretty MIA this year, and I have lots of excuses. But the big one? I've been lazy. Instead of opening Blogger when I get home, I sit on FB or Pinterest, or don't even open my laptop. It's been a big fat lazy summer, and before that, I was not in a great headspace - really stressed with my old job, stressed trying to find a new one, stressed about not getting pregnant right away. Stressed. Stressed. Stressed. So now that fall is upon us, I wanted to ramp this bad boy back up. No promises on 3-4 posts a week, but I'm going to set a very attainable goal of one per week until I get back in my blogging groove thang. I can't believe it, but we're having a BABY! We'd been trying since last fall, and were actually about to take a break when I got a Big Fat Positive! This whole thing has been overwhelming, but we are super excited to welcome our little pickle into the world in January (due January 16). I've stocked up on pregnancy books, baby bargain books, and parenting books; and I've signed up for more baby apps and newsletters than my inbox can probably handle. But after love, and after marriage, but before the baby, comes the pregnancy announcement! 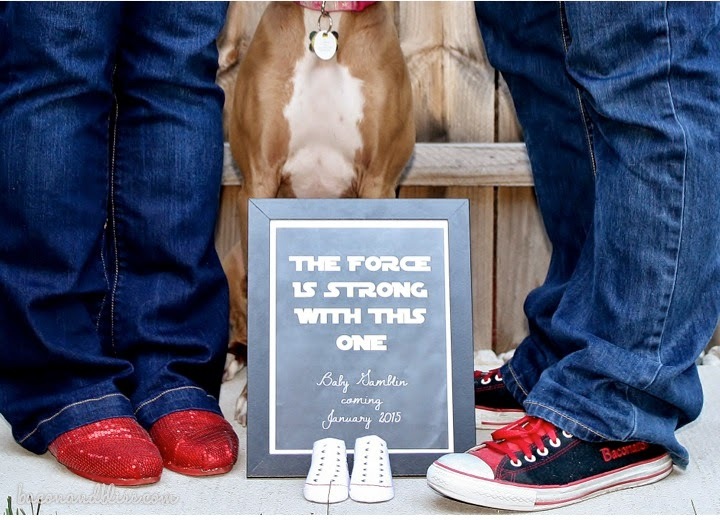 Since the Baconator is a huuuuuuge Star Wars fan, as proven by our dog, Leia, and his killer Jedi costume (that I handmade), I knew I wanted to incorporate that into our announcement. We used a Star Warsy Font (SF Distant Galaxy Alternate) and the iconic saying along with our wedding shoes and some itty bitty Converse to announce to our friends and family on FB that a baby is coming! A friend took our pic in our backyard after work, and this bad boy was up online the next morning. How did you tell the world? Do you have any newbie parenting advice to share? The more of these I do, the more excited I get about these prompts. I legit think they are getting even better. For Day 7, we have... SENT. I don't have a single thing that I sent that was the best... in fact, I still have two Christmas presents sitting on my desk from 2013 that I haven't sent yet (sorry guys!). But you know what I did send this year? Oh yeah, BUNCHES of SnapChats. I first heard about Snapchat at the beginning of the year, but didn't actually start using the app until this summer. My friends and I send each other selfies of pretty much the ugliest faces ever and so many photos of our dogs. Every time I open the app I have at least two wacky dog pics preparing to load, and it is seriously the best. I know that teens use it for sexting and that I'm about a decade too old to have an account, but it's so fun. I got a Snapchat birthday message this year of my friend Cory singing Happy Birthday with a pointy hat drawn on his head. This is the future, and it's so amazing. So for 2014, I'm excited to see what new technology comes out! What's the best thing you sent? Have you been following along? Here we are on day six of #WEverb14 and today's prompt was CAPTURE. Share your favorite memory captured from 2013. What's your plan to capture 2014? So the preferred memory capturing technique of 2013 was definitely selfies. Legit, we are in our late twenties and love taking selfies. 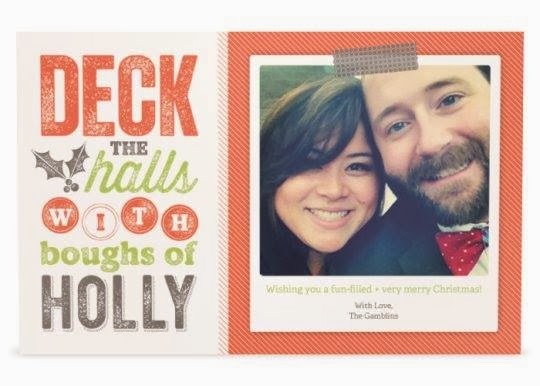 It was so intense that I couldn't find a decent photo of the two of us for our Christmas card and ended up using a selfie taken at a wedding. Don't believe me? So in 2014, I plan on capturing more photos using our digital SLR camera. I started the year with our DSLR at the NYE party, and I want to keep on using it. We are planning another trip to Jamaica and a trip to DC and a trip to NOLA and (hopefully) having a baby - all of those are great reasons to take proper photos!! 2014 will be the year of lots of photos! Yay!! Today's prompt is SING. What song or lyrics will be forever tied to 2013 in your mind? What songs are you excited to keep with you through 2014? Guys, I LOVE singing. Back in high school I was in not 1, not 2, but 3 choirs and I was even nerdy enough to go to choir camp. I love singing that much. I'll admit, I was not the best, but I can hold a tune, and belting along to Taylor Swift is still one of my all time favorite things to do in a car. And now that we have a car, I've been doing LOTS of that. So naturally, the song that I most associate with 2013 is Taylor Swift's 22 - I liked it so much I blogged about it. While I was actually 28 for much of 2013, I can't help but love lyrics like "It feels like a perfect night to dress up like hipsters" and "We ditch the whole scene and end up dreaming instead of sleeping." In case you aren' t familiar with it, turn your volume on full blast and get your dancing pants on when watching the video. But what about the song I want to keep singing in 2014? It's the rhythmic lovechild of my guilty pleasure artist (Pitbull) and the Baconator's (Ke$ha) - TIMBER!! This little gem worked its way into my regular rotation a couple months ago when he discovered it somewhere on the internet, and now it's a staple of every car ride. What song do you want to keep on singing?